Peel the eggplants, cut off the ends, and slice lengthwise into 1/4 inch slices. Cut these slices across, lengthwise again, to obtain long strips the size of skinny fries. Cut them in half if they’re too long. Place the slices in a colander with a bowl underneath the catch the liquid. Sprinkle with the salt and mix with your hands, giving your eggplant slices a little massage so they are evenly covered in salt. Allow them to sit for 3 to 4 hours, mixing and squeezing the liquid out with your hands every hour or so. You can also place a weight on top to help get the liquid out (a plate topped with a big bag of flour works well). After 3 to 4 hours, rinse the slices well with tap water and drain. Squeeze as much liquid out of the eggplant slices as you can, using your hands. Place the squeezed eggplant aside. Bring the vinegar and water to a boil. Place the eggplant slices in the boiling mixture and boil for about 2 1/2 minutes. Do not leave in the boiling water longer than 3 minutes or the eggplant will be mushy. It should still have some bite to it. After about 2 1/2 minutes, remove the eggplant from the liquid and drain. Once they are cool enough to handle, squeeze out any excess liquid with your hands again (you can also leave the slices to dry for a few minutes on a clean towel, wrapping them in the towel to press some of the liquid out). They don’t have to be fully dry but they shouldn’t be dripping wet. Stuff the eggplant into clean jars, alternating in layers with the chopped parsley and basil, chopped red pepper, and minced garlic. Press down so that everything is well packed. Pour olive oil into the jar until all the ingredients are covered. Press down with a spoon to remove any air bubbles in the jar. Add extra olive if needed, leaving about 3/4 inch of space at the top. Wipe the rims and close the jars. Keep in the fridge for up to 1 week, or freeze. Serve on fresh toasted bread or add to any sandwiches. 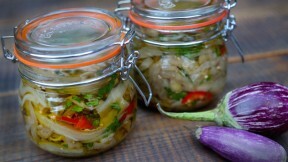 Pickled eggplant is great in pasta salads. Note: Pickled eggplant in oil should not be stored at room temperature due to the risk of botulism when garlic and vegetables are added to oil. Storing in the fridge for up to one week or freezing is recommended.